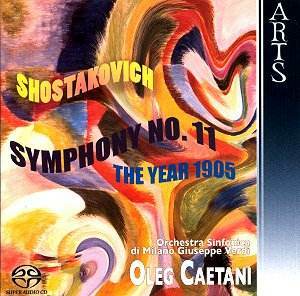 Each Shostakovich symphony enshrines a complex of messages, some of them apparently contradictory.� The spur for the magnificent Symphony No.11 was the fiftieth anniversary of the pre-Revolutionary events of 1905.� In that year in St. Petersburg, a peaceful demonstration by starving Russians had been brutally put down by the Tsar�s cavalry - graphically represented in David Lean�s film of Doctor Zhivago.� The horror and bitterness thus engendered gave the movement towards the Revolution of 1917 an unstoppable momentum. Yet in 1956, even as Shostakovich was working on his commemorative symphony, the Soviet-backed Hungarian secret police put a violent end to an uprising in Budapest.� Shostakovich�s sense of outrage at these events, and his awareness of history repeating itself in a terrible way, spilled over powerfully into, particularly, the second movement of the work in progress. For many years, the symphony, along with other programmatic works by the same composer, was viewed with suspicion in the West, and thought of as little better than film music.� Over a period of time, though, it has established itself as a major milestone in the composer�s output, and a worthy successor to the seventh and eighth symphonies. The first movement, in its sustained evocation of uneasy calm, is one of Shostakovich�s finest achievements. Thickly divided strings, playing pianissimo and without vibrato, combine with rumbling timpani and fanfares in muted brass, to suggest with uncanny intensity the atmosphere of the snow-covered Palace Square before the violence.� Folk-songs, one in low flutes, another rising from the depths in double basses, come and go like faces glimpsed in the ghostly half-light.� This movement never seems to fail in its impact, and Caetani�s reading is no exception. Given that this is a �live� recording, and that this movement is mostly very soft, the Milanese audience in March 2003 are mercifully quiet and unbronchitic! As the work unfolds, Caetani shows himself an intelligent and disciplined interpreter.� The waves of climaxes of the second movement, culminating in its final astonishing outburst, depicting the January massacre, are strongly characterised, and the orchestra is equal to its task.� The sudden shocked silence when the hammering of the percussion stops, where the ear slowly adjusts to a barely perceptible trilling in the strings, is one of the greatest moments in all of the composer�s output, and is well captured here. But the main disappointment in the present CD is the slow movement that now follows.� Entitled Eternal Memory, it begins with the violas quietly playing the melody of a revolutionary folk-song � �You have fallen as victims of a fateful battle�.� Despite starting in a slow and dignified way, the conductor rather loses his grip on the tempo, and the music is allowed to proceed too fast at the climax.� There are also balance problems here, with trumpets and drums far too loud for the important statement of the germinal theme in the strings (track 3, 11:14). The finale is better, and Caetani is faithful to the composer�s tempo indication of Allegro non troppo (my underline) � many performances are simply too quick at the outset.� Audience noise does rather intrude during the lengthy cor anglais solo, where the composer can perhaps be criticised for letting the tension drop too far, even though the episode is structurally and musically necessary. And I�m not sure about those bells at the end � cavernously deep-toned, they seem removed from the texture, depriving the conclusion of some of its momentum. A creditable rather than brilliant recording, then.� The power of this magnificent symphony undoubtedly registers, but there is a feeling of �nearly but not quite� about the whole thing.� As a live experience, it may well have been something very special; as a recording intended for repeated hearings, it isn�t really competitive.